Does your baby hate diaper changes? Does your baby cry, fuss, or even scream during diaper changes? You can help baby enjoy their diaper changes and make it into a sensory experience. Try these ways to help keep baby happy and having fun during diaper changes. 1. Sing a song and encourage face-to-face contact. Favorites like “Twinkle Twinkle Little Star” or “Old MacDonald” are great song choices. Don’t worry about how you sound; your baby will just love hearing the sound of your voice and looking up at you. 2. Narrate your actions and describe baby’s sensory experience. Describe everything you do from pulling open the diaper, to getting a new one, and putting on their clothes again. Use motherese or a sing song voice and explain what she is feeling. Tell her she may be cold for a moment but reassure your baby it will be over soon. You can also ask baby questions such as how it feels to be clean. Your baby will begin to make the connection between what she is experiencing and the words you use and help baby’s speech and language development. 3. Point out and name your baby’s different body parts. While baby is on the changing table, make statements like “you have two feet” as you hold their feet or count their toes on each foot. 4. Give them a toy to play with. Some babies hate diaper changes. When using baby wipes and switching diapers, give them a toy to play with to keep them calm and distracted. Interesting patterns, contrasting colors, and moving objects in your baby’s nursery can provide fun, visual stimulation. You can decorate the ceiling or hang up a mobile for baby to look at while on the changing table. 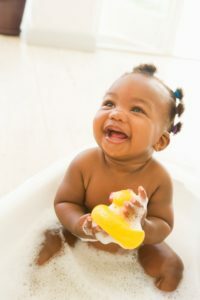 Some baby creams have different smells that can provide your baby with a new sensory experience. But be sure to test the cream and watch out for allergic reactions. Remember: trust your instincts! If your baby’s moods or behaviors seem unusual to you, bring it up to your pediatrician or health care provider. Activities to make bath time fun and a great sensory experience. There are many common types of infant equipment but did you know spending too much time in containers can cause delays in milestones?